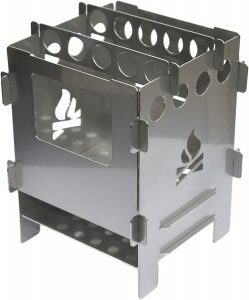 A great multi-fuel pocket stove, designed and manufactured in Germany. Environmentally friendly, simple configuration allows the Bushbox to be used with wood or other organic material,such as standard Trangia burners, Esbit or other fuel tablets. Stove is very small and lightweight, fits into your pocket or back pack. This stove also comes with an ash pan for soil protection. Great for boiling water and cooking while stealth camping.